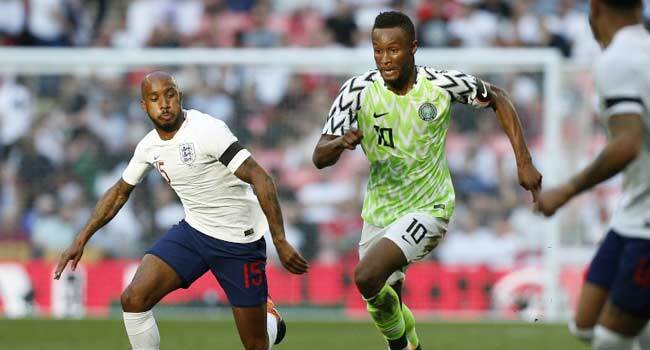 Gareth Southgate’s side swept into a two-goal lead as Gary Cahill and captain Harry Kane netted in a dominant first-half display at Wembley on Saturday. 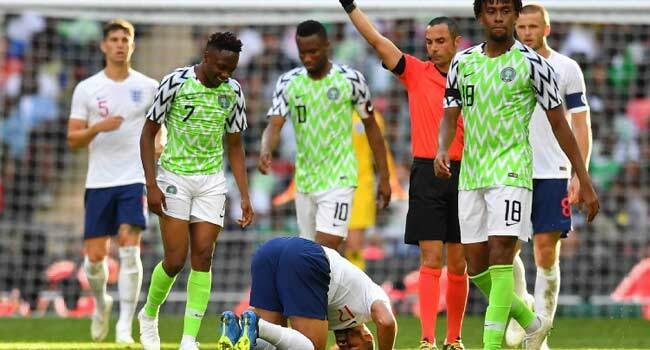 Alex Iwobi reduced the deficit for Nigeria, who came close to equalising after exposing the flaws in Southgate’s three-man defence by repeatedly attacking down the flanks. Southgate still has time to work on those tactical issues as England have one more friendly — against Costa Rica in Leeds on Thursday – before they fly to Russia for their Group G opener against Tunisia in Volgograd on June 18. But the England manager will also have to consider having another talk with Sterling after the City winger’s latest controversy. Speaking just before kick-off, Southgate admitted he had doubts about selecting Sterling after he arrived a day late for the start of England’s training camp due to a flight mix-up as he returned from holiday. Sterling had apologised to his team-mates after Southgate laid down the law — but that wasn’t his only issue since he joined up with England as the 23-year-old was forced to defend his new tattoo of an M16 assault rifle. After flopping for England at Euro 2016, Sterling has a point to prove and his fine form in City’s Premier League title-winning campaign was on display in his eye-catching first-half performance. But Sterling couldn’t stay out of trouble and was booked for an embarrassingly clear dive in a failed attempt to win a second-half penalty. Alli, who has a Nigerian father, didn’t seem perturbed and he was soon celebrating when England took a seventh-minute lead. Kieran Trippier’s free-kick forced a fine save from Francis Uzoho and from the resulting corner England pounced. Again it was Trippier’s precise dead-ball delivery that did the damage as the Tottenham right-back picked out Cahill, who got between two Nigeria defenders to power his header past Uzoho. Cahill was making his first England appearance since October after his late-season return to form with Chelsea convinced Southgate to recall the centre-back. Following an inconsistent season with Tottenham and some diffident displays for England, Alli needed to cement his place in Southgate’s team and, ignoring the hail of boos, he was making a convincing case. Spotting Trippier’s over-lapping run, Alli teed up his Tottenham team-mate for a low cross that Lingard flicked goalwards, only for Uzoho to make a fine save. Everton goalkeeper Jordan Pickford, making only his third international appearance, didn’t have a save to make until a straightforward effort from Chelsea’s Victor Moses in the closing seconds of the first half. But the 24-year-old was picking the ball out of the net three minutes into the second half as England’s three-man central defence of Cahill, Kyle Walker and John Stones were exposed. Sterling’s troubles weren’t quite over and he was booked for his crude attempt to win a penalty when Uzoho came off his line to block the winger’s run.